I am always playing around with ways to add more beans to my diet. And one of my favorite ways to eat beans is in a big chilled salad. Chilled salads, like today's recipe, allow all the flavors to marinate into the beans, creating so much flavor and loveliness. 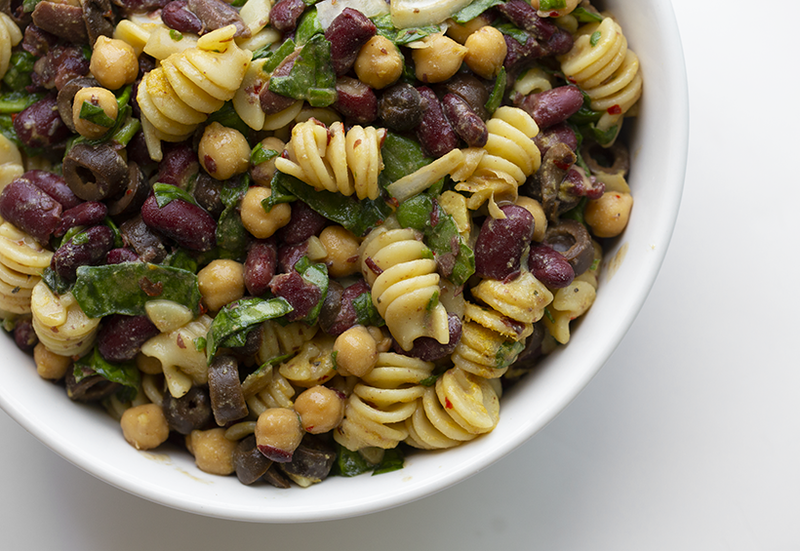 Today's Two-Bean Pasta Salad actually includes two of my favorite ingredients: beans and pasta. Fluffy pasta spirals all cozy and warm, tucked in between layers of purple beans, ruffles of spinach, lemon juice, balsamic, pepper and salty olives. 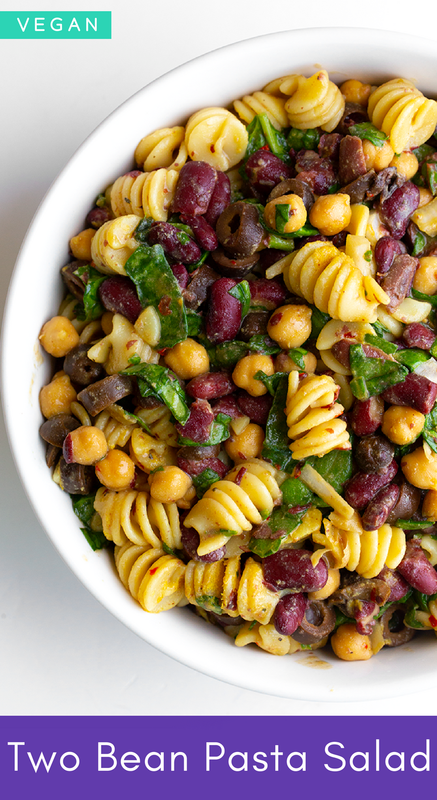 This bean-loaded pasta salad reminds me of a dish you would find in a fancy deli or bakery shop. The kind with loads of picnic-approved pasta salads and such. 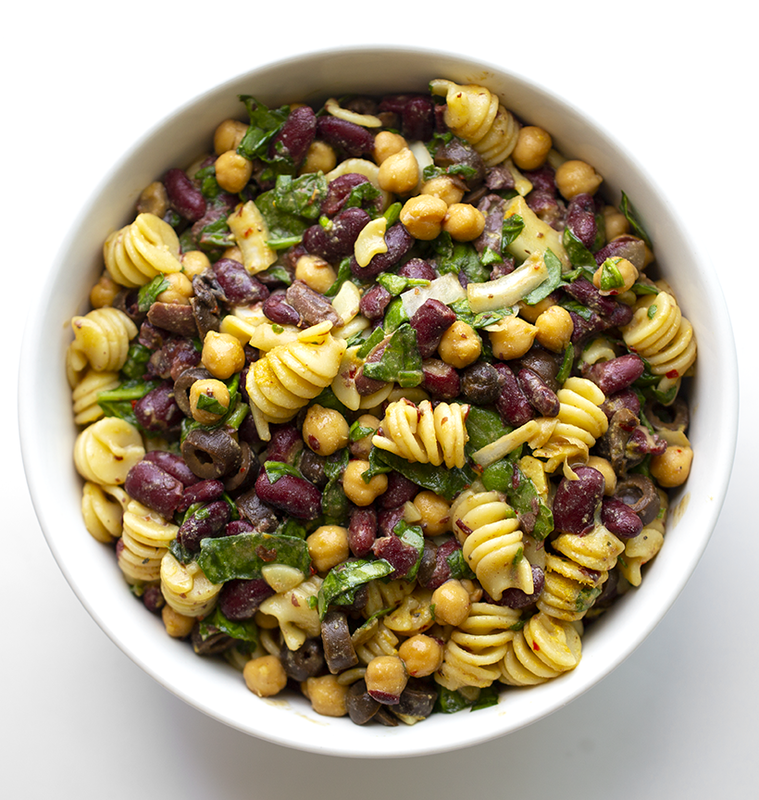 So if you are looking for a flavorful, healthy way to serve beans - or if you just love a good make-ahead approved, chilled pasta salad - give this a try. Plus, a few of my fave vegan picnic recipes!.. ..Of course this salad gets placed in the fridge where all the fun happens. The chilled temps lock in all those flavors and allow the juices to seep further into the pasta, veggies and beans. And though I love this salad warmed up or even served right away after that initial toss - when you serve this salad chilled, the flavors and textures are taken to a new level. 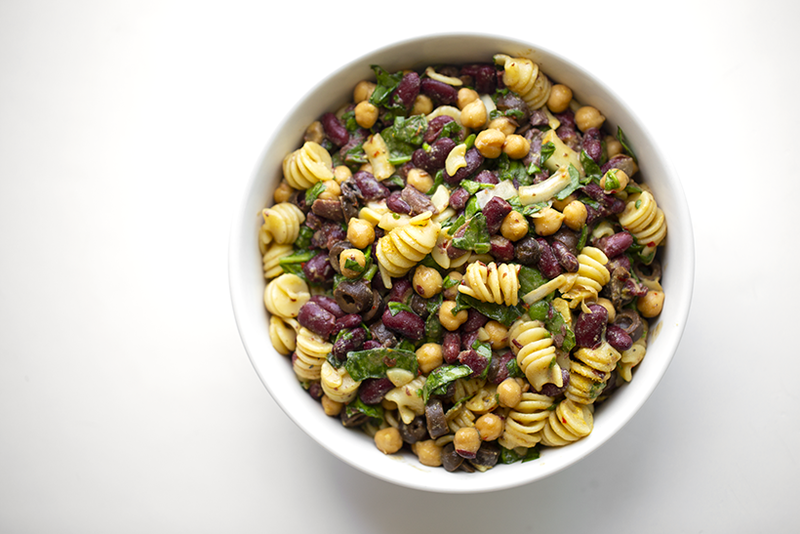 Other bean-y salads here on HHL. Back in 2010 I posted a simple lemon two-bean salad. Then last year I did a simple kidney bean salad. But this time, I added fluffy pasta - bringing the flavor and texture level to a new, lovely level..
My favorite thing about this salad is how delicious it gets after sitting in the fridge for a few hours. All the flavors mingle and the beans and pasta become marinated with flavor. I also love the complexity. 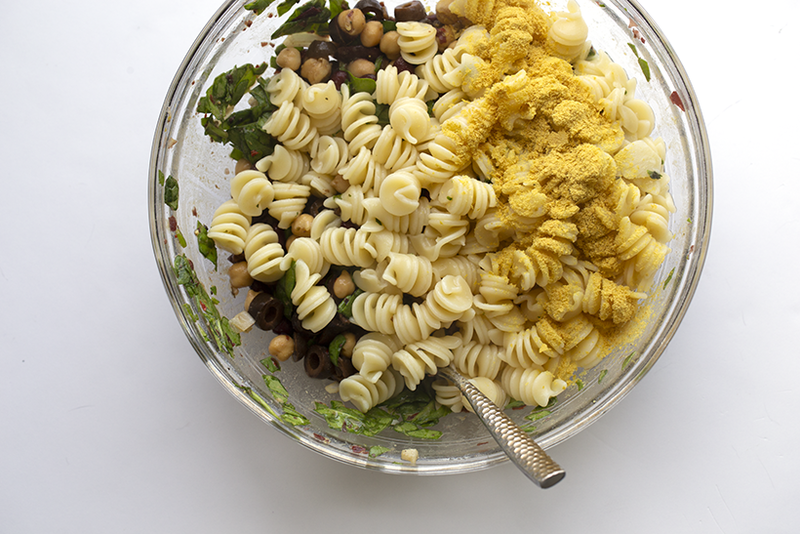 Textured veggies and nutty chickpeas. Some saltiness from those olives. Some sweetness in there too. Cheeziness. A hint of spiciness. Fluffy pasta. And loads of bright acid from lemon and vinegar. 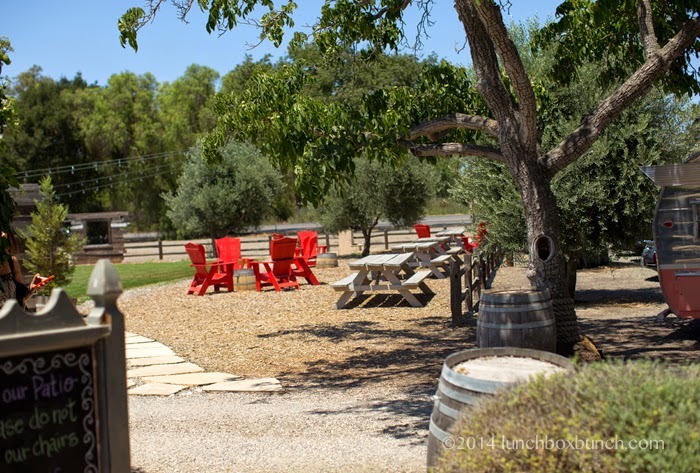 I shared some picnic tips in this post! 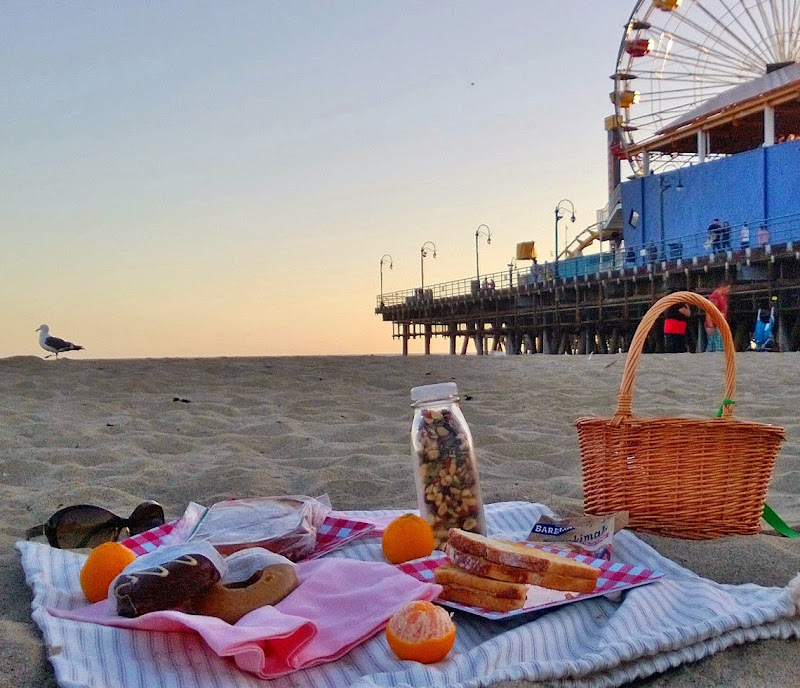 Beachy picnics are probably my fave.. 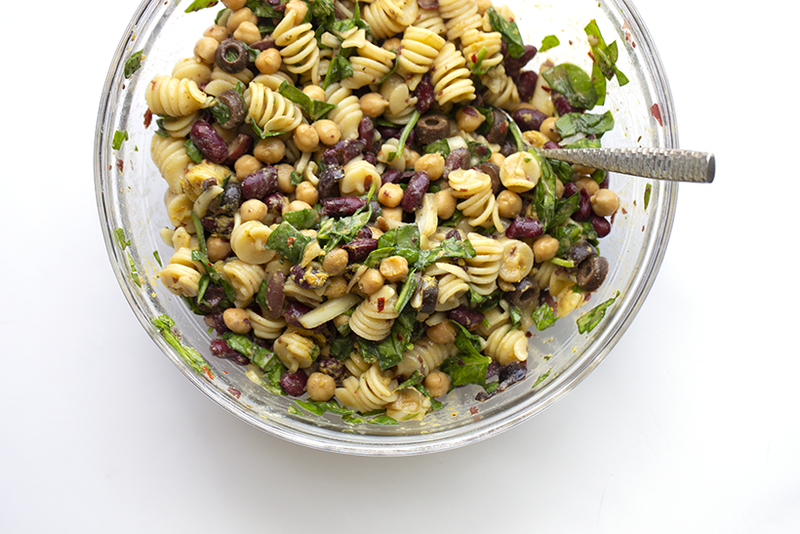 This cravable pasta salad can be made ahead and served chilled - or eaten right away, served warmish. 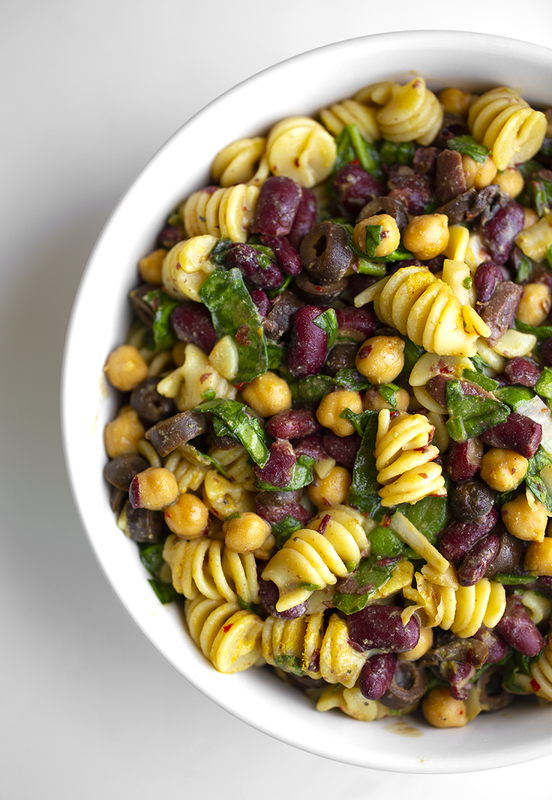 This flavorful, bean-loaded pasta salad is delicious served warm or chilled. Make-ahead perfect! optional: fresh herbs, roasted or fresh garlic, teaspoon or two of agave syrup for a kick of sweet..
Bring a large pot of water to a boil and drop your pasta. Boil according to package - until tender. While the pasta is cooking.. Drain and rinse the beans and add to a large mixing bowl. Also add the spinach, lemon juice, balsamic, oil, olives, garlic, salt, pepper and red pepper flakes too. Fold everything together for a few minutes. The agave is optional, but adds sweetness in addition to the sweet balsamic accent. Set the bean mixture aside and check on your pasta which should be just about ready. Drain pasta and add it to the bean bowl. Toss everything together. Add more seasoning/salt/pepper or fresh chopped herbs or additional veggies to taste. Cover bowl and allow the pasta to chill in the fridge for an hour before serving. Delicious served warm or chilled.